An enhanced recovery after surgery (ERAS) program might be effective for postoperative recovery in elderly patients undergoing thoracic surgery. 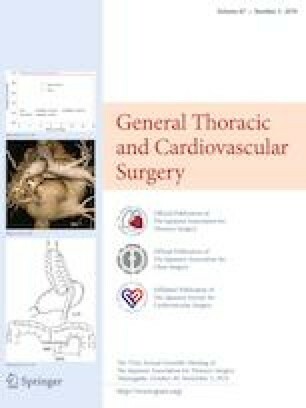 This study aimed to clarify the impact of ERAS on the post-operative recovery of elderly patients, with regard to shortening hospital stay and reducing complications after open thoracic surgery. We used a prospectively collected database and retrospectively accessed the data of patients who underwent lobectomies or segmentectomies for pulmonary malignancies from April 2013 to March 2018 and evaluated outcomes after implementation of ERAS. ERAS patients were those who completed an ERAS program. The control patients were those who underwent surgery before June 2015 and later operated patients who did not receive ERAS. Propensity score matching was performed to balance the characteristics of patients in both groups. Patients were also divided into the following three groups for evaluating the efficacy of ERAS: patients aged < 65 years, 65–74 years of age, and ≥ 75 years of age. Before propensity score matching, the ERAS patients had shorter postoperative stay, shorter duration of chest tube drainage, and lower rate of postoperative complications than the patients without ERAS. The difference between readmission rates was not significant. After matching, the ERAS patients had shorter postoperative stay. The difference between readmission rates was not significant. After matching, the postoperative hospital stay was shorter in the patients aged ≥ 65 years. ERAS shortened the length of postoperative hospital stay in patients aged ≥ 65 years and did not increase readmission rates. These findings were presented at the 32nd European Association for Cardio-Thoracic Surgery, Milan, Italy, October 18–20, 2018. Conception and design: SS. Administrative support: ME. Provision of study materials or patients: All authors. Collection and assembly of data: All authors. Data analysis and interpretation: SS. Manuscript writing: All authors. Final approval of manuscript: All authors. Satoshi Shiono: None declared. Makoto Endo: None declared. Katsuyuki Suzuki: None declared. Kazuki Hayasaka: None declared.